An article from The West Australian, Wednesday, 29 May, 1963 showing the WAMRC layout in the Harveys’ home in Cottesloe. As discussed at the last general meeting, a wonderful piece remembering early members of the club, Sid & Yvette Harvey, has been written by life member Don Finlayson — thanks Don! By a wonderful stroke of coincidence, a few months ago a member of the public gave us the above newspaper clipping above from May 1963 which is directly relevant to the story. Head over to the Harveys’ page to read all about it. George’s funeral was very well attended last Friday and Don Finlayson has written a lovely obituary for George. It is now available on George’s Memorial Page. 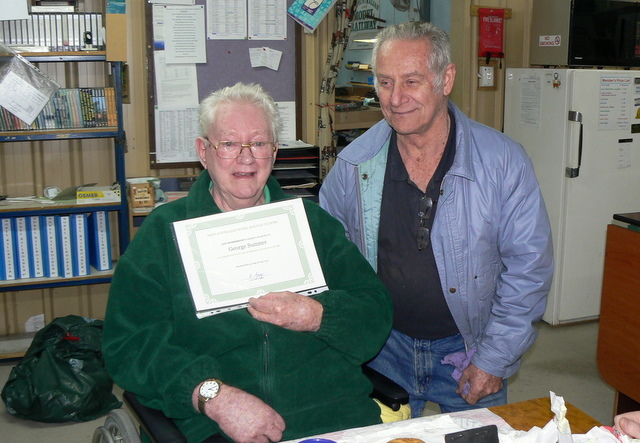 George Sumner in 2011 when he was awarded his life membership certificate by Tony Gray. Paul Webb phoned me yesterday to let me know the sad news that George Sumner passed away in hospital on Friday night (26th January 2018). 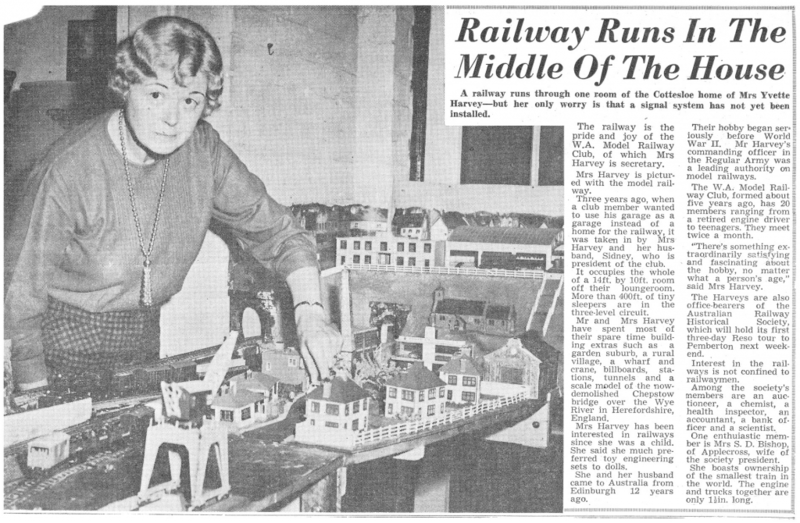 Is this the future of Model Railway Clubs — an activity you do in seclusion and only interact with others on the Internet? One of the first posts on that page is the latest plans for the upper level of the public layout. Head there to check it out and let us know what you think! 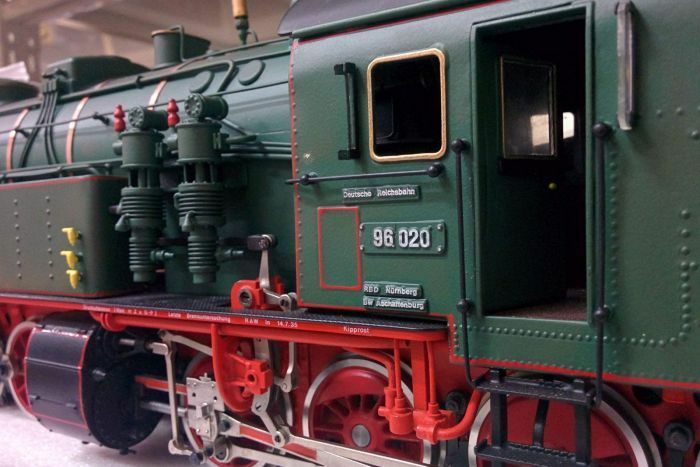 A secret collection of model trains that needed its own house in southern New South Wales and came with a staff bound by confidentiality agreements is being documented at the Workshops Rail Museum, west of Brisbane. Read the full story on ABC News. Wishing all members and friends of the WAMRC a very Merry Christmas and a safe and Happy New Year! 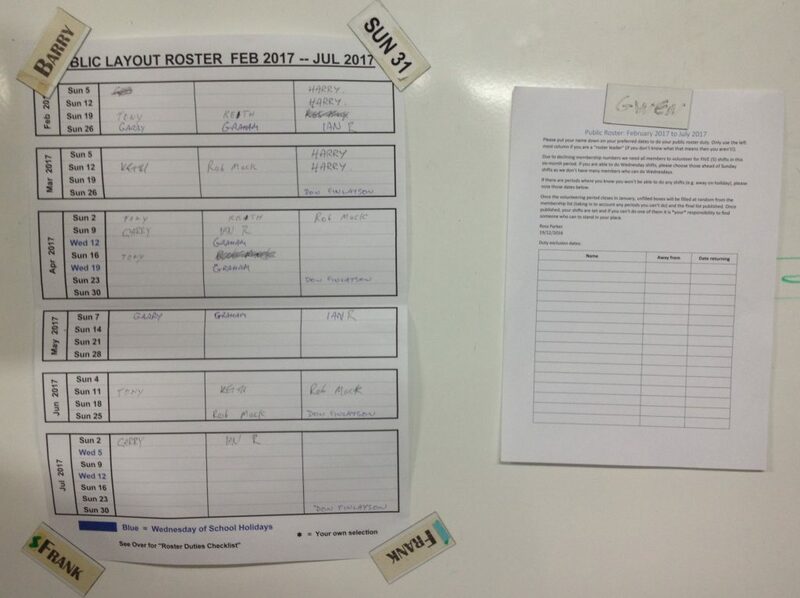 The new public layout roster volunteering form is now on the whiteboard at the club. Please make sure you drop in to the club before mid‐January and put your name down for your preferred dates. I’ve also added a second sheet where you can specify specific dates (or ranges of dates) where you know you will not be available. How Fast Is That Train? New member Pete Wright brought along his latest acquisition on Wednesday night to demonstrate to other members: an Accutrack II Speedometer from Sprog DCC. It’s quite a neat little self contained unit, battery powered and self supporting with a perspex ‘tunnel’ for the train to run through. It supports multiple scales [US‐N (1:160), UK‐N (1:148), US‐HO (1:87.1) and UK‐OO (1:76.2)] and the speed display can be in miles‐per‐hour or kilometers‐per‐hour. The tunnel is quite wide and tall — big enough for double N‐gauge track, or a single HO line with double stack containers. Speed sensing is done using infra‐red sensors — an LED and diode at each end of the unit pick up the train as it traverses the tunnel by breaking the reflected beam off the white card on the far side of the tunnel. 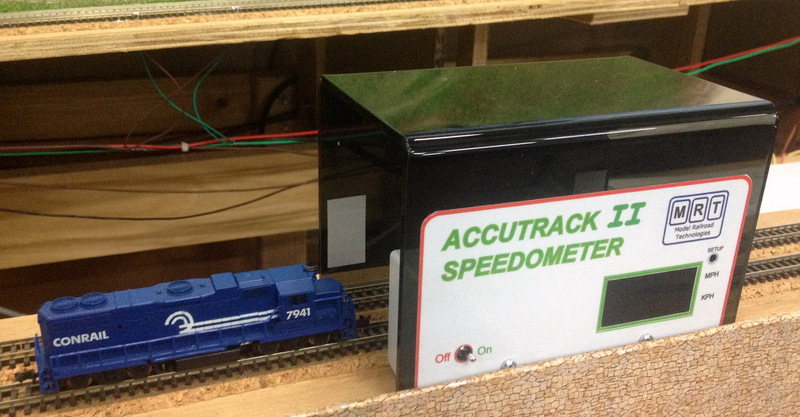 Some quick testing showed a little variation in repeated passes of a light loco through the tunnel at a constant speed — but this may have been due to variations in the speed of the loco itself.